Many older homes feature rooms that are a little on the small side, and even a brand new house can have a kitchen or bathroom that feels claustrophobic. Before you put an addition on your home, consider making some decorative changes. Sometimes the smallest adjustment can have a powerful impact and effectively make a small room feel large and luxurious. Here are a few of the ways that adding marble to tight spaces will make them look more spacious and welcoming. Choose a single color of marble with minimal veining to trick the eye and visually enlarge the space. Light colors like Bianco Dolomiti are generally a smart choice because they naturally make areas feel larger. However, the consistent shading in Adalia Cappuccino will also work nicely. The goal is to minimize the colors in the space and put a solid tone on the floor. The eye will follow it across the space, making it feel much larger and more luxurious. Try to avoid heavily veined marble for this purpose as it can bring too many colors to the space and undermine your efforts. Another excellent choice is Vanilla Oro both for its consistent coloring and brilliant white finish. Place the marble tiles close together to minimize the grout lines and allow the eye to skip from one tile to the next without a visible break in coloring. The grout that is used should match the tiles as closely as possible to achieve the best results. Another trick used by designers is to carry the flooring materials up onto vertical surfaces. The goal is to use it in small ways that will make a great impact, including on bathtub aprons and as baseboards. When these materials match each other perfectly, the mind automatically assumes that the vertical surface is part of the floor. While people will logically realize that matching tiles have been used, that initial impression of spaciousness remains the same. This method works beautifully with tiles in light to medium tones. It’s commonly used with white or cream tiles, but you can create a stunning effect using light beige and even gray. You can also employ slightly larger grout lines as this effect relies more on the vertical surfaces than a single-shade finish. It’s possible to make the room feel even larger by combining the monochromatic finish with matching baseboards or tub aprons. The tiles you choose are important, but how you space them is also a vital element of the room. When tiles are set a distance apart, the gap must be filled with grout. Even when you choose a matching shade, grout lines will show across the floor. When developing an intricate pattern, you want those lines to stand out to make the pattern more visible. Yet when you’re trying to enlarge the room and make it feel more luxurious, you’ll want those lines to be virtually invisible. Place the tiles as close together as you can and use a matching sandless grout to finish the floor. The tiles will blend with each other to create the spacious look you’ve been dreaming of. You can also choose larger tiles to further minimize the grout lines. Creating more space between the lines creates the illusion of space, and that makes a small room feel more inviting. A general rule of thumb is that dark colors make a space feel cozy while light colors open it up. This is partly because shades of white and cream reflect more light to make any area feel larger and more welcoming. Keep this in mind when choosing the marble tiles for your project. Rather than going with the bold Rojo Alicante for the floor, reserve that color for the counters or another area. Use Crema Bella or Crema Marfil Marble to cover the flooring instead and finish it off with matching grout. 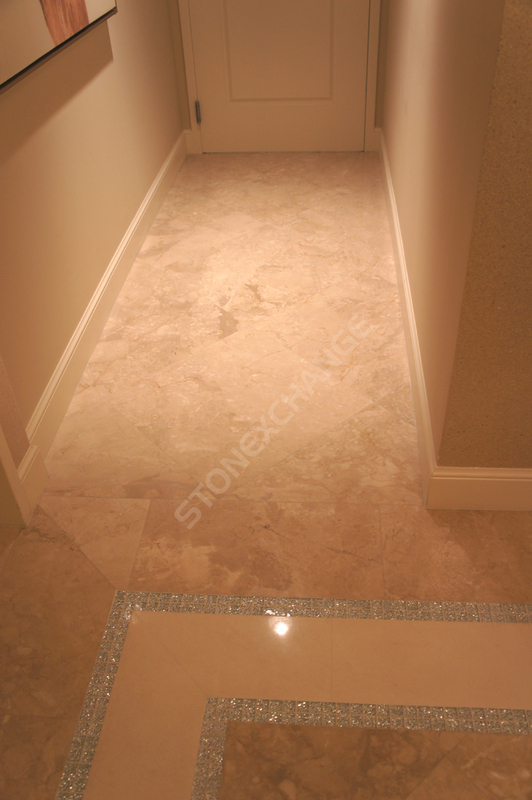 Unlike ceramic tile, marble has the ability to reflect light. Bringing more light into any area makes it brighter, and that leads to an impression of spaciousness. This is why so many designers use mirrors to visually enlarge rooms that might feel a little small otherwise. Polished marble is surprisingly reflective, so you can achieve the same effect without installing any mirrors. Whether you go with a white shade or take it a little darker with Crema River, you can still reflect more light into the space and enhance the feeling of spaciousness. The direction of your tiles can also make a difference in how large the area feels. Imagine using 12-inch square tiles in a galley kitchen. Running the tiles in a basic checkerboard pattern maintains the rectangular feeling and can highlight the narrow space between counters. However, you can turn things around by putting the tiles into a diamond pattern. With this technique, the longest part of the tile will line up between the counters. Furthermore, the tiles will literally point into the space beyond the narrow strip. You’ll make the kitchen feel larger by doing nothing more than turning the tiles. Even when the grout is matched to the tiles and the lines are minimized, the pattern may still show up slightly, so this method can prove quite useful. Expand your projected waste numbers because harlequin patterns do require more cuts and generally produce slightly more waste. How a floor feels to the bare feet is also important. It’s unclear why, but research shows that warm flooring materials make a space feel smaller while a cold material makes it feel larger. Marble maintains a relatively stable temperature that’s slightly cool to the feet. While it’s not uncomfortable, it can be enough of a difference to trick the mind and make any tight space feel more grand. When you’re ready to finish a small area, call Nalboor to place your order for luxurious marble tiles. We offer a range of colors and sizes. All of our high-quality tiles are meticulously crafted to minimize flaws while bringing out the beautiful colors. We know that your project budget is important to you, so we also offer wholesale pricing to help you save a substantial sum of money. We maintain tight quality control and cost control standards so that we can maintain low prices for customers throughout the country.